Any long-standing resident of Wayne County, Ohio knows the highlight of September is the annual Wayne County Fair. Because the Fair has been around for 127, 154, or 164 years (depending on how you want to count the years: from 1850-1877 it was operated under the Wayne County Agricultural Society that went defunct, from 1878-1880 it was operated under the Wayne County Independent Agricultural Society that also went defunct, from 1881-1886 there was no “Wayne County” fair, then from 1887 until now the Wayne County Fair operated under another incarnation of the Wayne County Agricultural Society we still have to this day). In any case there are thousands of stories that can be told about the fair, things related to the fair, or people, animals, and structures associated with the fair or fairgrounds. This month in honor of the fair, I’ll add another story, hopefully one you have not heard before, to the heap. Pictured is an example of an old high-wheeled racing sulky. These types of sulkies were predominantly used in harness horse racing before the early 1890s. 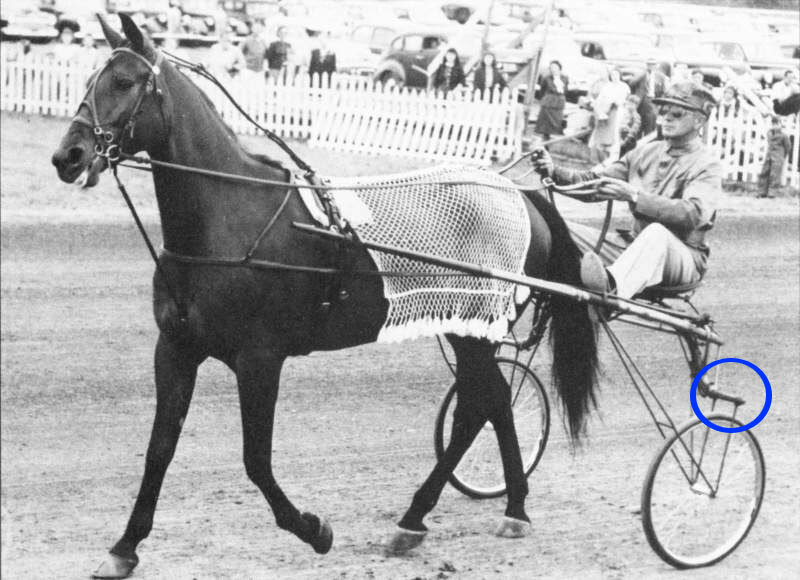 After working as a harness racehorse trainer based at the Wayne County fairgrounds for many years one thing always puzzled me: I could never find or locate an example of an old high-wheeled racing sulky within the county. It was a type of sulky predominantly used from the 1850s to the early 1890s when the invention of the pneumatic tire, or rubber tube tires, put the old wooden high-wheels out of use. The big wheels were all wood and the parts made as thin as possible to reduce weight. Even nearby counties like Ashland, Richland, Stark, Medina, and Holmes seem to be empty of the old high-wheeled style of racing sulkies despite the fact that this area of the state was full to overflowing with harness racehorses. Furthermore, even the Wayne County Historical Society does not have one example of a racing sulky in their collection, despite the fact that Wayne County, Ohio had some of the best horse drawn equipment manufacturers in the State. The answer to what happened to all of Wayne County’s old high-wheeled racing sulkies, and probably all other counties along old State Route 30 between here and Marion, Ohio came when I stumbled across an old Wooster Daily Record newspaper article dated January 4, 1934. On page 12 of that edition was a small story about how Hollywood scouts for the Twentieth Century Fox Film Corporation had come to town looking to buy all the old high-wheeled sulkies they could find in the area. The old sulkies were needed for important horse racing scenes in which horse races as they were run in the late 1880s and early 1890s had to be reproduced for a movie about to be released entitled, David Harum, starring Will Rogers. The story of David Harum was originally a book published in 1898 written by Edward Noyes Westcott. It portrayed the character of a horse trading country banker who had a unique philosophy on life, often expressed in a whimsical saying, and depicts an era contemporary with the latter years of author Westcott’s life. For instance, one bit of David Harum philosophy imparted, “A reasonable amount of fleas is good for a dog––it keeps him from broodin’ over bein’ a dog.” Or “Some folks are like cider. They’re sweet till it’s time to work.” Harum’s golden rule: “Do unto the other fellow, what the other fellow’ud like to do to you, and do it fast.” The character of David Harum was an ideal fit for actor Will Rogers. The trotter, Nancy Hanks, is shown on the right hitched to a sulky fitted with pneumatic tires while the prompter horse on the left is shown hitched to the old wooden high-wheeled sulky. The smaller rubber inner-tube wheels produced faster times for a horse in a race than the big wood wheels and the wooden high-wheels stopped being used by the late 1890s. The film scouts had been looking in upstate New York during December of 1933 and failed to find the old high-wheeled sulkies there and were directed to look in Ohio, the heart of harness horse racing country. The movie personnel proceeded to Marion, Ohio where they had hired the Houghton Sulky Company to build a safe replica of an old high-wheeled sulky that actor Will Rogers could use during his movie scenes. While in Marion they learned that Wooster’s, Edson A. Rickabaugh who started racing harness horses around 1907, and was a well-known area horse owner, trainer/driver by the 1930s, had stored a couple of the old high-wheelers in his barn at the Wayne County fairgrounds. The movie people promptly came to Wooster the last week of December 1933 and closed a deal with Rickabaugh to purchase his old high-wheeled sulkies. They were immediately shipped west to the Hollywood set of David Harum. The movie was released in March of 1934. This 1948 photograph shows driver Dunbar Bostwick and trotting horse, Chris Spencer, hooked to the high-wheeled sulky used by Will Rogers in the David Harum movie. Notice how the axle (circled in blue) where the original big wood high wheels would have been connected were re-purposed so rubber tube tires could be used on the racing sulky. 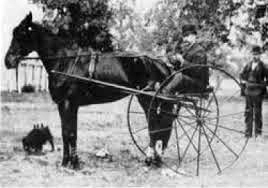 Many of the old wood high-wheel sulkies were retrofitted like this so horse trainers did not have to go and buy a new racing sulky in the 1890s. Ed Rickabaugh could personally recount, being a 15-year-old railbird in 1888, that one of the sulkies shipped to Hollywood was used in a race in the year 1888. Hitched to it, he recalled, was a fine grey trotting horse with a winning mark of 2:17 3/4 named, Newton B., that was owned by Wooster-area banker W. P. Snyder. The other sulky was practically a duplicate of the first but Rickabaugh could not remember it’s exact history. Previous to the Fox movie people’s visit Rickabaugh said the sulkies had been preserved and stored in his barn at the fairgrounds in very good condition and were only brought out once or twice a year for local historical events but had been enjoyed by all who had seen them over the years. Unfortunately money talks and local historic items like the old high-wheeled sulkies were sold and are gone forever. As a consolation, the Wayne County high-wheeled sulkies can still be seen today: they were utilized in the race scenes of the 1934 Fox film, David Harum, which the Wayne County Public Library has a DVD copy available to watch. Check it out sometime and see a small bit of Wayne County history in the movie. You can see how much the modern day racing sulkies, now called “race bikes”, have changed at the 2014 Wayne County Fair: harness racing is conducted on Tuesday and Wednesday afternoons, post time at noon. Hope to see you at the races.